For other uses, see Fair (disambiguation). "Funfair" redirects here. For other uses, see Funfair (disambiguation). A fair (archaic: faire or fayre), also known as a funfair, is a gathering of people for a variety of entertainment or commercial activities. It is normally of the essence of a fair that it is temporary with scheduled times lasting from an afternoon to several weeks. Street fair, a fair that celebrates the character of a neighborhood and merchant oriented, (as the word 'fair' is historically defined; that being a marketplace). As its name suggests, it is usually held on the main street of a neighborhood. Fête, an elaborate festival, party, or celebration. Festival, an event ordinarily coordinated and/or celebrated by a community or group with a theme e.g. music, art, season and/or on some characteristic(s) or aspect(s) of a community, or the region i.e beach, snow, local harvest, etc. or state the community is in. This can include a tradition, history, an prevalent ethnicity, religion, or a national holiday, e.g. The Fourth of July. County fair or agricultural show, a public event exhibiting the equipment, animals, sports and recreation associated with agriculture and animal husbandry. State fair, an annual competitive and recreational gathering of a U.S. state's population, usually held in late summer or early fall. It is a larger version of a county fair, often including only exhibits or competitors that have won in their categories at the more local county fairs. Trade fair, an exhibition organized so that companies in a specific industry can showcase and demonstrate their latest products and services, study activities of rivals, and examine recent market trends and opportunities. 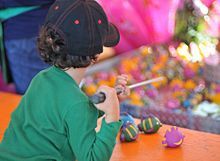 Traveling carnival, usually simply called a carnival, an amusement show made up of amusement rides, food vendors, merchandise vendors, games of chance and skill, thrill acts, and animal acts. Traveling funfair, a small to medium-sized traveling show primarily composed of stalls and other amusements. The Roman fairs were holidays on which there was an intermission of labour and pleadings. [clarification needed] In the Roman provinces of Judea and Syria Palaestina, Jewish rabbis prohibited Jews from participating in fairs in certain towns because the religious nature of the fairs contravened the prescribed practice of Judaism. In the Middle Ages, many fairs developed as temporary markets and were especially important for long-distance and international trade, as wholesale traders travelled, sometimes for many days, to fairs where they could be sure to meet those they needed to buy from or sell to. Fairs were usually tied to special Christian religious occasions, such as the Saint's day of the local church. Stagshaw in England, is documented to have held annual fairs as early as 1293 consisting of the sales of animals. Along with the main fair held on 4 July, the city also hosted smaller fairs throughout the year where specific types of animals were sold, such as one for horses, one for lambs, and one for ewes. The Kumbh Mela, held every twelve years, at Allahabad, Haridwar, Nashik, and Ujjain is one of the largest fairs in India, where more than 60 million people gathered in January 2001, making it the largest gathering anywhere in the world. Kumbha means a pitcher and Mela means fair in Sanskrit. In the United States, fairs draw in as many as 150 million people each summer. Children's competitions at an American fair range from breeding small animals to robotics, whilst the organization 4-H has become a traditional association. Because of the great numbers of people attracted by fairs they were often the scenes of riots and disturbances, so the privilege of holding a fair was granted by royal charter. At first, they were allowed only in towns and places of strength, or where there was a bishop, sheriff or governor who could keep order. In time various benefits became attached to certain fairs, such as granting people the protection of a holiday and allowing them freedom from arrest in certain circumstances. The officials were authorized to mete out justice to those who came to their fair; eventually even the smallest fair would have had a court to adjudicate on offences and disputes arising within the fairground, called a pye powder court (from Old French pieds pouldres, literally "dusty feet", meaning an itinerant trader, from Medieval Latin pedes pulverosi). The chaotic nature of the Stagshaw Bank Fair with masses of people and animals and stalls inspired the Newcastle colloquialism "like a Stagey Bank Fair" to describe a general mess. The American county fair is featured in E. B. White's Charlotte's Web. ^ Schäfer, Peter (2002). The Talmud Yerushalmi and Graeco-Roman Culture. Mohr Siebeck. pp. 448–. ISBN 9783161478529. Retrieved 8 June 2015. ^ a b Norderhaug, Jennifer; Thompson, Jennifer Norderhaug & Barbara (2006-08-01). Walking the Northumbria Dales: Un. Sigma Press. pp. 63–. ISBN 9781850588382. Retrieved 8 June 2015. ^ Millions bathe at Hindu festival BBC News, January 3, 2007. ^ Kumbh Mela pictured from space - probably the largest human gathering in history BBC News, January 26, 2001. ^ Kumbh Mela: the largest pilgrimage - Pictures: Kumbh Mela by Karoki Lewis The Times, March 22, 2008. ^ a b c Von Drehle, David (2007-07-23). Photographs by Greg Miller. "A new Day at the Fair". Time. 170 (4): 50. ISSN 0040-781X. "Fair" . Encyclopædia Britannica. 10 (11th ed.). 1911.